Ranthambore Mount Valley Resort offers opulent and tranquil vacation away from the hustle and bustle city life. 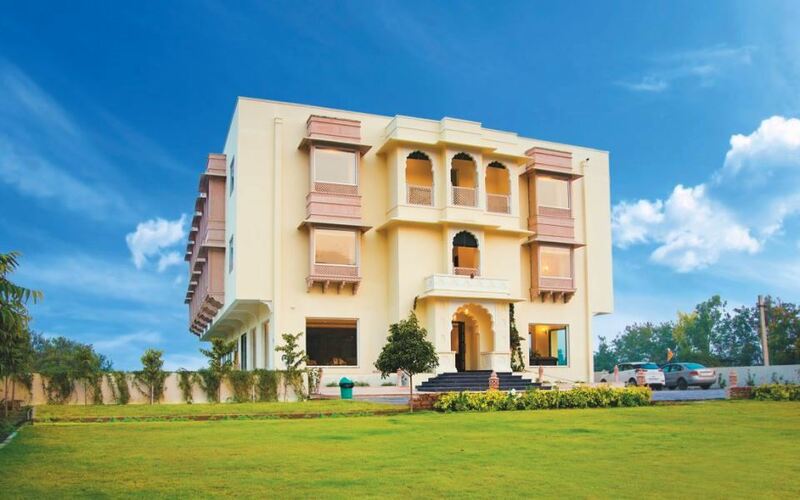 The Hotel Mount valley is located amidst the enchanting surroundings of the breathtaking mountainous terrain near the dense forest of the famous Ranthambore National Park. Ranthambore Mount Valley Resort is a beautiful hotel situated between the hills of Aravali and Vindhyas. Hotel Mount valley Ranthambore welcomes guests on the land of tigers and provides modern amenities where you will feel comfortable at home. It is a glorious heritage retreat with modern facilities and offers excellent services to the guests. Ranthambore Mount Valley Resort is a beautiful place to stay in Ranthambore which offers special hotel packages for individual guests, family group and corporate. The exterior and interior of this heritage hotel has been designed to maintain the ethnicity of the forests which provides unrivaled holiday experience by adding high-level grandeur and contemporary luxury to its guests. There are total 32 rooms in Hotel mount valley Ranthambhore, including two spacious categories, which have 28 Nature view deluxe room and 4 Mount view super Deluxe Room. The Hotel Mount Valley is the ideal place to stay in Ranthambore for personal, family and groups, where guests can enjoy mountains and nature with ease at bed. All rooms have been made with large and comfortable 'Jharokhas' (heritage windows). These Jharokhas can also be used as an extra bed. Deluxe and super deluxe rooms are well-designed and spacious with the soothing combination of the sleep lounge and provide aesthetics with a pleasing combination of work area. The rooms of the hotel are designed to make you relax and eliminate anxiety because you embrace the new reality of the full harmony of the environment during your stay in Ranthambore. The Hotel rooms are pretty spacious and elegantly furnished with all the modern amenities such as Air-condoned, satellite LCD TV, Mini Fridge, comfortable chair with writing table, Tea & Coffee maker, hair dryer, intercom service, 24 hours Hot and cold running water, Eco Friendly Toiletries and large attached bathroom. The large attached bathrooms are equipped with premium bathroom amenities. Standard check in time is 12.30 PM and check out time 11.00 AM. Early check in and late checkout is on request and subject to availability.